The city's car-free block party from Central Park to the Brooklyn Bridge marks its 11th year. See how great Manhattan can be without cars! Welcome to the first of three “Summer Streets” days — when New Yorkers get their annual reminder of how great Manhattan could be if there were no cars. Of course, the Department of Transportation’s 11th annual car-free event only covers a narrow corridor — seven miles from Central Park, down Park Avenue to Lafayette Avenue to Centre Street to the Brooklyn Bridge — and it’s only for the first three Saturdays of August, from 7 a.m. to 1 p.m.
There’s no question people enjoy Summer Streets, but Streetsblog has long argued that its vision of a car-free Manhattan needs to be greatly expanded — and probably could be if it wasn’t so expensive due to heavy police presence. Stillwell Avenue between Surf and Bowery, and on Bowery from W. 12th to W. 15th. Completely forgot that it’s August already! Still not sure I’ll make it out there by noon, though. So obnoxious that they drive everyone off the street right when the fun should be starting. We need to have something similar in each of the outer boroughs in at least one place, preferably several. It should run from dawn until at least midnight like a street fair. It should last at least two days. Moreover, we should do the same thing in spring and fall, possibly even winter. Not all of us are early birds. My body tells me I should be in bed at least until noon. And not all of us like being out in hot weather. I’ll always take a nice, crisp fall day over a 90 degree day with high humidity like the Sunday forecast calls for. I especially don’t get the 7AM start time. Who is up at 7AM on a Sunday unless somebody is paying them? 11 AM or noon is when this should start. It should run as late as practical. This event seems designed to cause as little inconvenience to motorists as possible, not designed for those who might wish to attend. The heavy police presence is completely unnecessary. There aren’t cops at every corner when Park Avenue is infested with cars on a normal day. But on a day when the street is opened up, this requires blanket police coverage? This is just free overtime for a do-nothing assignment. It exists because the police, considering themselves not subject to any authority, have decided that it is they, and not the elected mayor, who get to make policy. Please stop by the Five Borough Bicycle Club’s free bike repair table during Summer Streets! We’re at 25th & Park. We’re doing free safety checks, repairs, advice, hands on repair coaching, and more. Saturday, but still I think the whole rationale is that no one’s up yet. Drivers aren’t out, so get up early if you want to enjoy a car-free street! (They’ll have important driving to do all afternoon, so we must cede the pavement by 12:45.) That may have made sense while testing the concept, but it’s so obvious now that it needs to go all weekend all summer. For some reason I had Sunday in my head, even though the article said Saturday. But yes, this really needs to happen every weekend for the entire weekend all summer, and a couple of times in the spring and fall. It wouldn’t even be completely off the mark to have it once or twice in the winter. A lot of people still do their outdoor physical activities in the winter. I also wish DOT would re-open the Murray Hill Tunnel like they did a few years ago. Even without an art installation, it’s really cool. Why should it be for Passenger Cars Only? 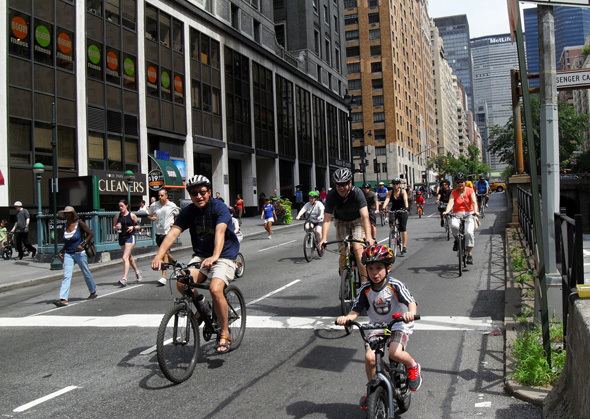 Saturday marks the first Summer Streets of the year, where New Yorkers can bike and walk on seven car-free miles between the Brooklyn Bridge and 72nd Street from 7 a.m. to 1 p.m.